This article describes the different capacity module view settings. Enter a value in to increase or decrease the table length. The default length is 16 weeks. Select the bucket type to view the scheduled load. Default is days. May also view in weeks. There are three options to reflect scheduled load. The user may opt to view one or all of them. 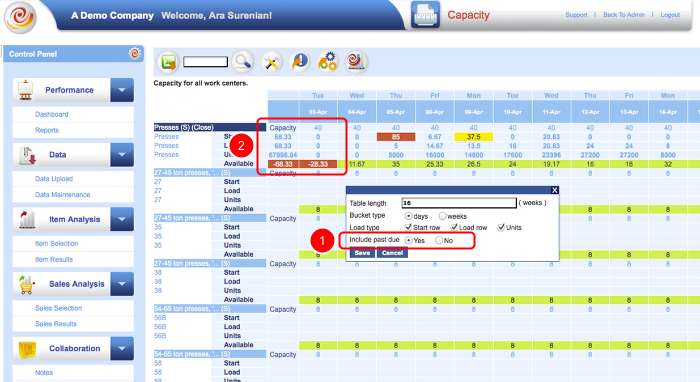 Start Row: Select this to view the total number of units scheduled to start on a given day or week by work center. 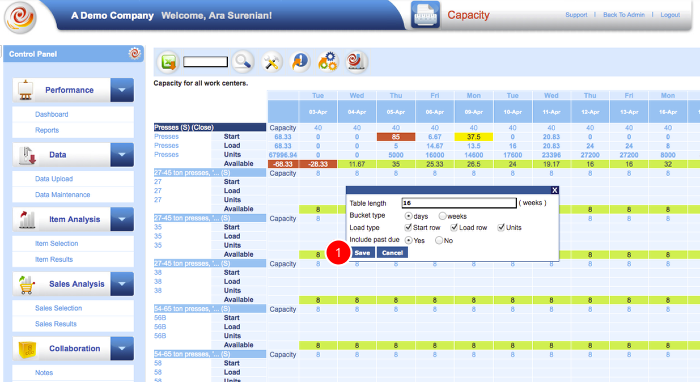 Load Row: Select this to view the hours scheduled per day or week based on the routing and constraint based scheduling reviewed in the Capacity Module Overview article. Units: Select this to view the number of units scheduled each day or week by work center. Including past due places all past due hours in the past due column of each work center. This is based on the items routing and scheduled completion date as described in the Capacity Module Overview. The total hours are assumed to not be completed and therefore are rolled forward to reflect how many days or weeks the work center is past due. If shop order progress is included as part of the data upload these hours should not include any hours or operations that have already been completed. If progress reporting is not available, we recommend not including past due. Once the view options have been selected, click save to allow the view to be recalculated to refect the settings.